Owned by SC du Château de Rayne-Vigneau (Mestrezat), this 79 ha property produces on average 20,000 cases per year. 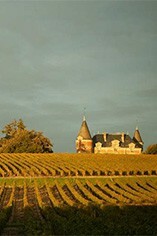 Located in the south of the Sauternes appellation, next to Ch. Lafaurie-Peyraguey, the property shares a similar climate to that enjoyed by Sauternes. Hotter and more humid than the Médoc, autumnal early-morning mists, triggered by the meeting of the tributary Ciron and the river Garonne, create ideal conditions for the development of `botrytis' on the grape skins. The vineyards (Sémillon 75%; Sauvignon Blanc 23%; Muscadelle 2%) are situated on a mound close to and overlooking `le Ciron' tributary. The wines ferment in double-lined, stainless steel vats before being transferred into oak, 60% new, for 18 months. In 1855 it was classified as a 1er Cru Classé.